Call 502-209-8512 to schedule your first appointment. If you suffer from hearing loss and you need hearing aids in Harrodsburg, KY, Miracle-Ear® would be glad to assist you. We offer a wide variety of hearing aids, and our hearing care specialists can help you find ones that suit your needs. Our hearing care specialists are caring, experienced, and eager to serve. We’re America's most recognized brand of hearing aids with more than 1300 locations throughout the nation. Each one of our locations is independently owned and operated. Our center proudly provides the latest technology incorporated into our hearing aids, such as our new GENIUS™ Technology. This technology includes features that work harmoniously with one another to provide the listener with a smooth listening experience. Wireless Windscreen technology removes interference from wind noise so you can decipher natural sound more clearly. Directional Focus technology helps listeners focus on front and center sounds while removing surrounding noise. The VoiceTarget 360 feature enables ears to zero in on conversations and people in any direction. You’ll hear natural sound processed in the same way as the brain processes it. GENIUS™ Technology uses Binaural Wireless 3.0 data transmission technology. This technology enables each hearing aid to receive audio signals from the hearing aid on the opposite ear. Each hearing aid receives input from four microphones, which creates an eight-microphone network that heightens sensitivity to the acoustic environment. Call us or stop by our hearing aid center if you’re in the Harrodsburg area. We have hearing aids for almost any level of hearing impairment. Our hearing aids come with a warranty** and a 30-day trial, risk-free†. We offer discreet hearing aids that match skin tone, and hearing aids you can control with a smartphone. Miracle-Ear technology can benefit your hearing in multiple ways from deciphering words to listening to music. We hope you’ll come discover and experience the Miracle-Ear advantage. Your ability to hear can greatly impact your overall quality of life. Whether you’re encountering a hearing problem for the first time or have been seeing a hearing specialist for years, if you feel that your hearing isn’t what it should be, come to Miracle-Ear. As an established hearing center in Harrodsburg, our goal is to help you reach the point where hearing isn’t something you have to think about, but rather, it’s something you simply do naturally. For more information about our Harrodsburg hearing center or to see how we can help you, call or visit Miracle-Ear today. 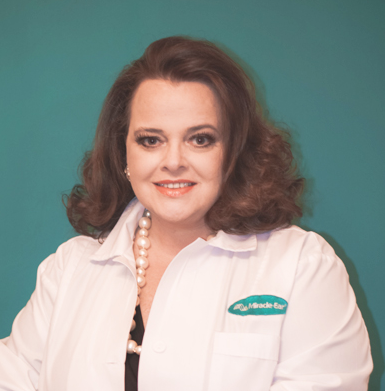 Jennifer has 10 years of experience working with Miracle-Ear as a Hearing Instrument Specialist. Jennifer is a Kentucky state licensed Hearing Instrument Specialist. She is a Miracle-Ear Certified Hearing Care Professional and won the Miracle-Ear Hearing Care Professional of the year award in 2015. Jennifer's favorite part of working at Miracle-Ear is being able to fit patients with state of the art technology that best suits their individual needs. Miracle-Ear is a patient oriented company that focuses on aftercare enabling their patients to reach their best hearing possible.